Aquarium and garden pond supplies. Tropical fish store specializing in rare and unusual cichlids, catfish, tetras, and community fish. Includes a list of fish and products they sell, photos of fish, ordering and shipping policies, FAQ, and information about their fish happy hour. Selling furniture and bowls for dogs, cats, and fish. Sells dog, cat, small animal, bird, fish and aquarium products. Selling fish, reptiles, birds, cats, dogs and related products. Products for all pets including birds, horses, dogs, fish and reptiles. Providing for dogs, cats, fish, birds, reptiles, and small animals. Products for dogs, cats, birds, fish, small animals and other pets. Online ordering. Supplies and food for dogs, birds, fish, ferrets, cats, rabbits, reptiles, and small pets. Selling beds, treats, medications, toys, collars and grooming products for dogs, cats, fish and birds. All natural odor remover, eliminates any odors including those caused by mildew, smoke, pets, vomit, and fish. Retailing merchandise for dogs, cats, birds, fish, reptiles, amphibians, and small animals. Search for product by name or by pet. Supplies housing, carriers, books, toys and treats for reptiles, dogs, cats, birds, fish and small animals. Sells live food for pets, fish bait, and backyard bird feed. Products include mealworms, waxworms, and crickets. Offers health, hygiene and fun products for dogs, cats, exotics, ferrets, fish, horses, reptiles, and small animals. Pet supplies for dogs, cats, freshwater and saltwater tropical fish, birds, reptiles, hamsters, gerbils, guinea pigs, ferrets, and other small animals. Featuring supplements, medication, vacines, dental care, grooming, dewormers, and flea and tick remedies. Has products for horses, dogs, cats, birds, ferrets, reptiles and fish. Offers videos that teach fish cleaning and cooking with fish. Sample recipes on the website. Fish food imported from Japan. Offering fish food for marine and freshwater tropical fish. Hand carved fish from basswood mounted on driftwood or plaques. Fiberglass fish replicas and miniature pewter hand painted fish pins for fresh and saltwater fish. Offers online sales of only fish finders and portable GPS receivers. Features tips on buying a fish finder. RSPCA online store with wide variety of products for dogs, cats, birds and fish. Also sells RSPCA logo merchandise. Australian location. Retailer offers live fresh and salt water fish, invertebrates, corals, tanks, and supplies for the fish hobbyist. Includes fish gallery. Supplies and accessories for a wide range of pets including fish, birds, mice, rats, guinea pigs, rabbits, turtles, reptiles, cats and dogs. Located in Australia. Offering a variety of naturally smoked fish including salmon, trout and albacore tuna. Cost-effective means of encouraging sport fish propagation. Permanent habitat for fish in inland waters, especially deep lakes that lack protective vegetation. Durable shelter for fish through all life cycles. Features contact information. If the business hours of Broad Mountain in may vary on holidays like Valentine’s Day, Washington’s Birthday, St. Patrick’s Day, Easter, Easter eve and Mother’s day. We display standard opening hours and price ranges in our profile site. We recommend to check out broadmountainpet.hostings.com for further information. 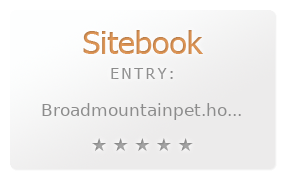 You can also search for Alternatives for broadmountainpet.hostings.com on our Review Site Sitebook.org All trademarks are the property of their respective owners. If we should delete this entry, please send us a short E-Mail.